Hello Jean. The next project looks relly fun. What an amazing concept your dawning on. My coments On the project: I thought it was a wonderful creative and intreging idea. Why particpate: If its creative and different and anyone can do it why not join in on the fun. Final image: A total shock. "What Me!?" Unbelievable. Amazing work to see so meny small image to create a flawless reproduction. In genral:It is something which involes and can touch so meny people. A snowflake of an idea that apaers to now be growing in to an expolsions of endless possiblilties. Keep on keeping on. I look forward to seeing where the path will turn next. Congratulations on your continuing master peices. It's very exciting what you have going on. I shell keep a look out always on your up coming projects. And If I return to Canada . I'm sure to be in touch. Holly  Ottawa, Canada (MOZAÏK H2O, MOZAÏK UV-Énergie tribale 2005) : It is a lovely concept for a formal piece, I really enjoyed taking part in the Human Mosaic. It was so interesting to view the art piece being created from the inside out. Before the Human Mosaic I had no idea how much commitment, time, support and love went into creating these community-based projects. Working with Jean and his team was always an adventure! I never knew if I was going to be on dry land, underwater or painted from head to toe!! Layla  Ottawa, Canada (MOZAÏK H2O, 2004) : It is a lovely concept for a formal piece, with beautiful rich colour and lines that were very eye-catching. I enjoyed seeing how you had chosen to crop the photos and colour them to form a cohesive whole work. I have not yet seen the Mozaik H2O mural. I have always been intrigued by the idea of posing for artists, but I had never been spurred to action until I was invited to do H2O. It was to satisfy my curiosity, but also the underwater angle made it doubling interesting to take part in. Jean, you are a pleasure to work with Jean René. I wish you all the best in your future projects. Layla. 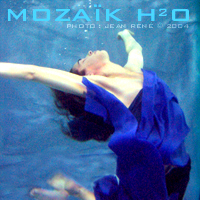 Jennifer  Vancouver, Canada (MOZAÏK H2O, 2004) : Participating in Mozaik H2O was a fantastic experience! I've been involved in athletics for several years now, and have lost touch with my creative side, so it was wonderful being part of an artistic project. Being a swimmer, I'm very comfortable in the water, and I'm also a very expressive person, so it was really liberating expressing my love of water in a non-athletic way for a change. I encourage people to participate in Mozaik, and join in this celebration of our bodies and our differences! Come as you are for art ! - Exposez-vous pour l'amour de l'art !